Why Study French in Paris with Us! We are a small-sized, warm and professional French language school with a reputation for excellence. We opened in 1997 and since then we have acquired a family of teachers who provide learners with unrivaled, personal tuition. 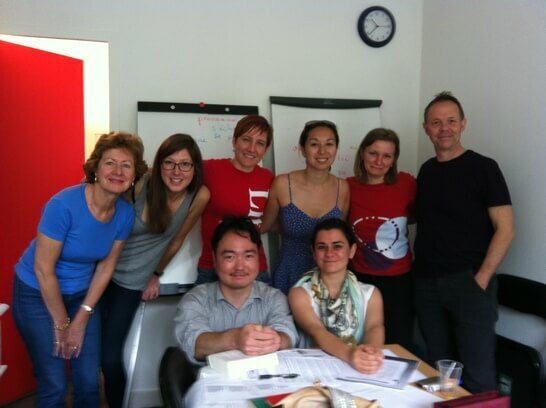 Many of our students extend their courses at our French language school in Paris. Many learners also come back years later or pop in whenever they visit the city. We think this is due to the fact that our school is a unique place. It’s a place where the students and the caring, friendly and professional school staff share valuable experiences of learning the French language in immersion. Very small class setting of 2-7 students: In order to allow a teacher to give “personalized” attention and instruction to each student, a small group setting is indispensable. It represents the foundation of our commitment in QUALITY teaching. Learning French in immersion: To have a truly immersing experience in French, students need to interact actively with teacher and other students. This is done through various class activities, such as role play and guided conversations. Our small class setting allows this to happen. Students can thus develop their communication skills naturally in French. Constant monitoring of student’s progress: Each student is unique and has a different speed of progress. At LUTECE LANGUE, student’s French level is monitored on daily basis and class placement is revised every week. For example, we change the class level if necessary for a student who shows a rapid progress. Central location: The school is based in central Paris, just a short walk from major tourist sites such as the Marais, Louvre, Notre Dame and Ile St Louis. We strive to achieve excellence, providing our students with the most efficient approach to acquire a real communication skills in French. Our school’s teaching methods for learning French in immersion are outlined in full below. Although translation helps students and teachers in classroom, it can hold back the development of student’s ability of oral comprehension and production in middle and long term. We believe that grammar and vocabulary are “tools” for communication and collecting these tools shouldn’t be the only goal in language learning. In our school, we focus on developing students’ skills to correctly and efficiently utilize “tools” in the acts of communication. This is the reason why we emphasize speaking practice in class. Traditionally, teaching grammar notions has been considered as the “main” part of a language program. Many schools often have a fixed course curriculum (LINER approach). However, we have adopted the SPIRAL approach because our goal is to let our students acquire the theory of French grammar as well as real, practical communication skills. Knowing a theory is one thing, knowing “how to use it” in the acts of communication is another. As we all know, it is easy to have a “knowledge” but difficult to put it into an “action”. We believe that students can develop efficiently their communication skills by moving forward step by step, regularly going back to the notions already learnt and practicing them in conversation. This is the core of learning French in immersion. Many students struggle learning a new language when placed in a large class. 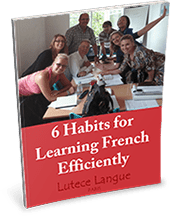 Even in a group of ten, students are unable to spend enough time practicing in class to effectively learn French. At LUTECE LANGUE, the class size is limited to seven students maximum This allows personalized learning and the active participation of each learner. Larger classes reduce the amount of time a teacher can spend per student. This particularly impacts less confident students who then do not get the support to practice speaking in class. At LUTECE LANGUE, our French teachers give personal attention to each student learning French in immersion, using very small class settings. The more time teachers spend in lecturing and explaining, the less time students get for oral practice. At LUTECE LANGUE, the emphasis in classroom is placed on oral practice of students. 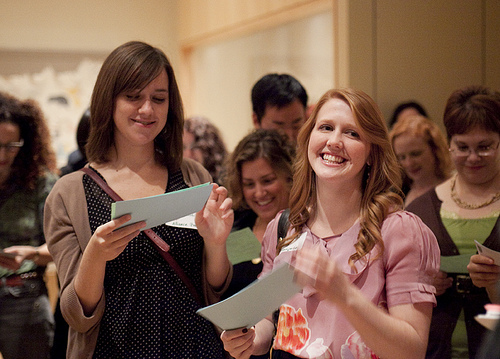 We believe learning through conversation is the best way to go about teaching. In other French language schools, teachers carry out their classes at their own pace. They are bound by a quota or curriculum set by the school board. Teachers that lack flexibility, don’t struggle to personalize the course to students’ needs and pace. It should not be the case of students having to adapt to their teachers, but the other way round. At LUTECE LANGUE, the teachers are autonomous and can choose the best teaching materials based on their students’ needs and requirements. The image of a French language school on the internet or through advertising does not always reflect the reality. LUTECE LANGUE has been providing quality French courses since 1997. More than 40% of our students from around the world return to further their studies, showing the true quality of our courses. It is common for students to feel anonymous in large schools with large classes. This is due to the fact that it is difficult for teachers to spot students who are struggling to learn when they are placed in large classes. LUTECE LANGUE is a small French language school that treats students like family. Our teachers tailor their teaching methods to each student and monitor his / her progress in French. When there is no personal link between school and student, the students can’t expect to have support and guidance. At LUTECE LANGUE, we are willing to build a long-term relationship. We work with students at the school in Paris and long distance via E-Learning. Our aim is to ensure that students feel supported whilst they are learning French in immersion. We provide the necessary guidance to help them achieve their goals. The teachers and school staff are always available to talk with the students, discuss their problems, find a solution and accompany their learning. Enter Your Name And Email Below For Free Gift !